The number of MBA students who pursue careers in real estate may be small, but even still, some of the most prestigious business schools in the United States offer exceptional programs that specialize in the field. An MBA in real estate can be earned as a certification, focus, major, or other in other variations. To help guide you through the premier options, we’ve put together a breakdown of the best of the best. The Top Schools for an MBA in Real Estate. Originally founded in 1908 as the Northwestern University School of Commerce part-time evening program, the J.L. Kellogg Graduate School of Management was a founding member of the American Assembly of Collegiate Schools of Business. Today, the school is ranked among the top graduate business school’s in the world. Kellogg offers full-time, part-time, Accelerated, and Executive MBA programs. Foundation: Students gain foundational knowledge and develop tools critical to the analysis of real estate transactions. Depth: Students specialize on specific institutions of the market and the interaction of real estate markets with urban planning, development, entrepreneurship, public policy, and law. The real estate pathway is not only for full-time MBAs, though. Evening and weekend students interested in this pathway should take Finance 1 or it’s prerequisite, if necessary, during your first quarter at Kellogg, rather than taking accounting. Founded in 1898, The Haas School of Business at UC Berkeley is the oldest business school at a public institution in the United States. Today, Haas offers a full-time, traditional MBA, in addition to the Executive MBA, and part-time MBA. 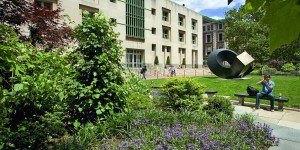 Founded in 1881, the Wharton School was the first dedicated school of business at the college level in the United States. Today, the school enrolls 1,788 total students in its MBA program and 436 students in the MBA Program for Executives. Wharton is also home to the Samuel Zell & Robert Lurie Real Estate Center. Each year the center sponsors conferences, seminars, and special programs for real estate students and faculty at Wharton. Columbia Business School (CBS), part of Columbia University, was founded in 1916 thanks in part to a gift from then sitting president of Chase Manhattan Bank. The school began awarding the MBA degree in 1945 and became a graduate-only program in 1952. For additional resources, Columbia real estate MBAs can always rely on the Paul Milstein Center for Real Estate for students and faculty alike, including guest speakers and panelists. Founded as the College of Business Administration in 1935, the UCLA Anderson School of Management initially taught vocational business skills, such as typing, shorthand, and penmanship, to people who would be teaching others. Today, the school offers a full-time, two year MBA program, as well as a part-time, Executive, and Global Executive MBA programs. According to the school, MBAs pursuing this concentration are also encouraged to take courses in taxation and law, as well as classes in related departments at UCLA, such as Urban Planning, Public Policy, Architecture, and Civil Engineering. It’s awesome to visit this website and reading the views of all friends regarding this paragraph, while I am also zealous of getting know-how.